A view of Marsh Harbor from Snappers. Blue Wing is out there at the back of the pack. The wind howls all around Blue Wing trying to blow us back out of the harbor into the Sea of Abaco, but our anchor has its mighty iron tooth dug firmly into the mud and hold us fast as we swing on chain and rode. It is a good day to stay put and luckily that is our only goal today, after 4 days in Marsh Harbor. We arrived in Marsh Harbor on Thursday March 8. The wind was still blowing strong from the front, but we had run out of a vital supply (rum), were running low on others and just needed to move on. 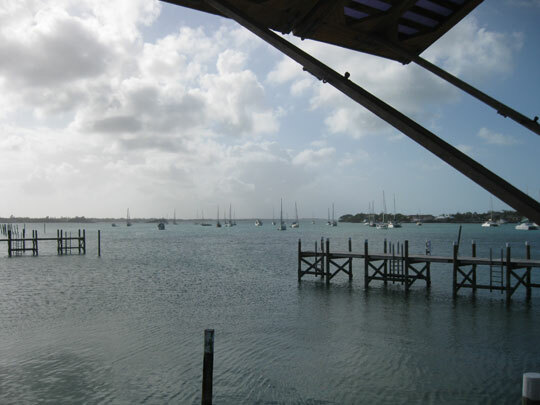 Marsh Harbor was just a short hop across the Sea of Abaco from Man-O-War Cay, so at high tide we headed out. 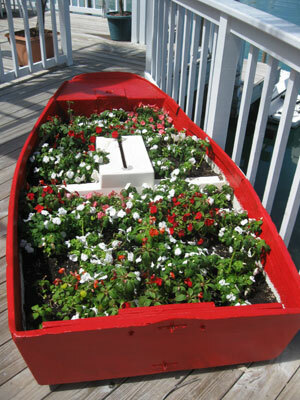 It must be the season for impatiens here in Abaco. You see them everywhere. As we arrived in the crowded harbor the wind and current were calling the shots. We have become fairly skilled at anchoring, but we have always anchored either in calm conditions or in spots with few neighbors. We didnâ€™t have either this day and it made a big difference. After an hour or so, but eventually we got the hook down without damaging our or anyone elseâ€™s boat and only scaring a few neighbors. 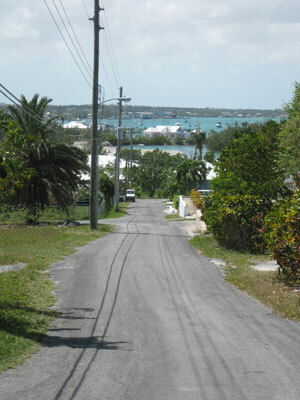 Marsh Harbor is the third largest city in the Bahamas. It is quite a contrast to the only other city we have been in on our trip so far, Alice Town, Bimini. There are lots of restaurants, bars and marinas lining the harbor. There is a nice public dinghy dock, many full sized hardware stores, a full sized marine supply store, several liquor stores and a giant supermarket named Maxwellâ€™s. While in the US I had provisioned the boat with lots of dried beans, grains and some canned food as well as enough fresh fruits, vegetables, tofu, tempeh and bread products to last a couple of weeks to a month. I was hoping I could buy more perishables as we ventured from place to place. 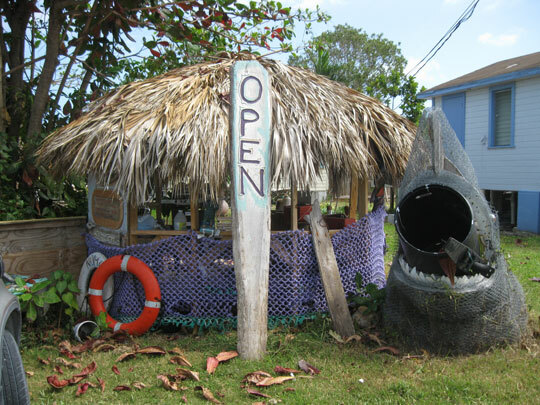 Bimini, our first stop, gave me a dim view of what I could hope to find, but really I wasnâ€™t expecting much. The grocery stores of Bimini were actually quite an improvement from the markets of the last Caribbean country I had visited. In January of last year we spent a week in Placencia, Belize, as small town at the end of a peninsula jutting into the Caribbean Sea. The grocery stores in Placencia were mostly stocked with what I call â€œholocaust food.â€ That is, food manufactured to be around long after anyone is left to eat it. Maybe this was a product of the particular circumstances of being a peninsula in a third world country with a thin connection to the main land or just the preference of the Chinese who owned all of the markets, but it etched the idea of what to expect of a Caribbean grocery store in my mind. So it was with great awe and relief when I walked into Maxwellâ€™s in Marsh Harbor. Maxwellâ€™s is huge. It is bigger than your average supermarket in the US and they have everything most American travelers could want (except for beer and wine), in addition to things Greg and I didnâ€™t think we would see again for another 6 months. They have Ezekiel bread! They also have tofu, organic produce and Muir canned organic tomato products. The prices are somewhat higher than they are in the States, but not a quite as high as I read they would be. I feel confident now that we wonâ€™t ever be reduced to eating plain beans and rice as long as we are in close proximity to Marsh Harbor. Greg enjoys a small indulgence, beer. You are probably wondering by now, â€œSo, Duwan, here you are in the Bahamas, have you enjoyed anything else besides this grocery store?â€ Well, yes, but our main mission here in Marsh Harbor has been to restock and to find a place to have my wifi booster sent to. If we had lots of extra money I could be telling you about all of the bars and restaurants, but we are on the budget Bahamas adventure. Still we have spent a little money on fun and entertainment. We have visited one bar, Snappers, which overlooks the harbor and has happy hour everyday from 5-7:30pm with $3 well drinks and $3 bottle beers. Snappers was the first bar we came upon as we walked down Marsh Harborâ€™s restaurant row, but I think it would have been the only one we would have stopped in anyways. Every other place we have seen seems a little bit too upscale for sailors on a budget who do their laundry in bucket and shower when it rains. A view of the harbor from an Marsh Harbor neighborhood. We have traded and bought books. Harbor View Marina has a fairly decent book swap (more decent now, in our opinion, since they have two of our Terry Pratchett books and the Hunger Games Trilogy in hard back). There is also a Buck-A-Book trailer that opens a couple times a week where we purchased a few books and a TV series from the â€™90 called â€œSpace Above and Beyond.â€ All the proceeds from our purchases go to help protect the 5 remaining wild horses on the island. We have also found a coffee shop where we can purchase canned OJ for $2 and get free wifi. This is a great improvement for me after spending $19 at happy hour to use the free wifi at Snappers, since #1 I am watching the budget and we canâ€™t afford happy hour every day and #2 I rather not spend happy hour communing with the computer â€“ it gives me a headache. And although laundry is never fun, we did splurge and do some at the Laundromat Harbor View Marina. It was a lot more fun than the bucket. We were not sure if they were open or not. The hours were posted, but were pretty convoluted. We walked in anyways to what appeared to be an interesting wood working shop in the house next to the hut. Alright you guys,somethings working for you,getting tan and all healthy looking! Love reading about your adventures! I’m happy you found provisions, and not too costly ones! 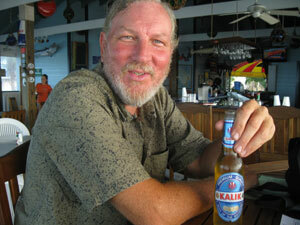 You should try Happy Hour on Caye Caulker in Belize (north of Belize City.) The sign there said “Happy Hour- 4pm until everybody happy!” But that’s the Caribbean lifestyle! It is nice to be able to keep up with you through this blog, and I know it helps your momma worry just a tad bit less, anyway. Mom’s been reading, too, and enjoying living vicariously through you. I’m sure she really wouldn’t want to actually be there, though! Be safe and have fun- and keep writing! What? You no like Wong market Placencia? Have tortilla chip and beer, what more you need? Keep the blog rolling, it is better than watching TV or reading about murders and politics! You both seem to be having a blast and loving it. Good for you! Stay safe and don’t worry, the water will be warm enough for Duwan soon! !